Join the Fight Against Formosa Plastics To Prevent Global Warming . 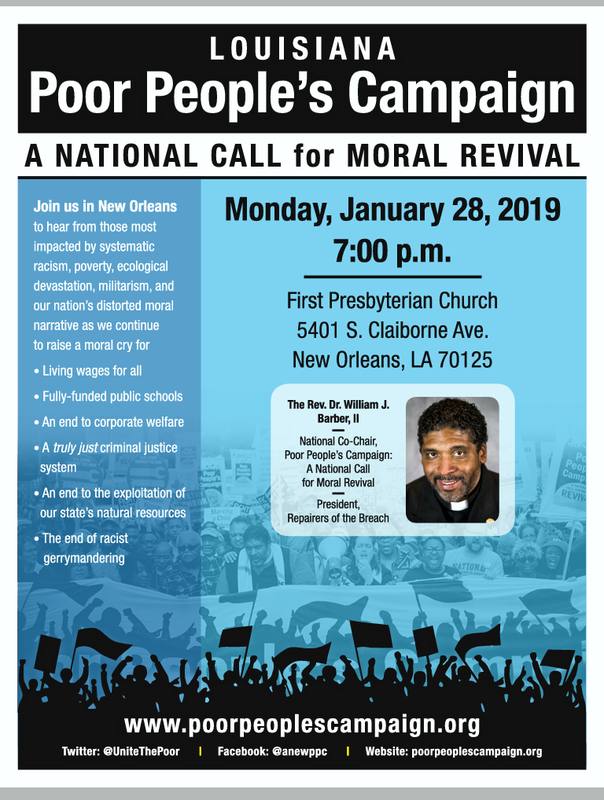 The National Poor People’s Campaign head Rev. Dr. William Barber joins the battle led by Rise St. James against multinational plastics giant Formosa Plastics Tuesday 5-8 pm at the West Bank Reception Hall 2455 Hwy 18, Vacherie, La.. The meeting is called a revival that seeks out moral organizations and individuals that will join to save this community and the earth. Formosa has been stopped before in Louisiana’s Cancer Alley. The Giant Formosa is one of the companies some scientists say must be completely stopped within 12 years to prevent global warming from rendering life on earth unsustainable. But Formosa’s $9.4 billion construction was attractive Governor John Bel Edwards who brought the company to St James which has become a zone of national sacrifice (ZNS), home to a majority of African-Americans. Zones of NS usually contain people of color and poor. Cancer Alley, the area between Baton Rouge to New Orleans is the nation’s leading ZNS. A free bus to the meeting site in Vacherie will board at 3:30 pm on Tuesday Jan 29 on Carrollton Ave near Rouse’s grocery story between Orleans and Bienville. Rev. Barber, long-time North Carolina head of the NAACP, the Moral Mondays of North Carolina, and now National Board member of the NAACP, is head of the National Poor Peoples’ Campaign (PPC). PPC is a revival of the coalition the Dr. Martin Luther King before he was assignated organized to stop the war in Vietnam and re-direct funds from the War to create jobs, construct housing, provide healthcare and support other human needs. Rise St. James, leader by Mrs. Sharon Lavigne, and several Black women fight another poisonous industry that will if allowed to be built, will be one of the most poisonous industries of the world. Massive fish kills in Vietnam, plastic pellets in waterways and fish in Texas, deaths in Taiwan are but a few of the company’s hallmarks. The St. James Parish Council voted this week to permit the plant to locate on the banks of the Mississippi River near Welcome along with 32 other poisonous industries in the heart of Cancer Alley. St. James Councilman Clyde Cooper, who opposed the Formosa Plastics plant, but voted for it, will be one of the speakers. Justice and Beyond, the coalition of justice seeking organizations, invites justice advocates to attend the Cancer Alley opposition meeting. Formosa was stopped in the nineties when Reserve businessman Carl Baloney and Herman Green, a retired educator joined with Gulf Coast Tenants Organization, LEAN, the Tulane Environmental Law Clinic and got the EPA to block Formosa from locating in St. John Parish after the Parish Council approved the plant, which would have been the largest plastics company in the world. *Pat Bryant is a founder of Justice and Beyond. He is now key strategist for J&B.